Ice fishermen are taking to the lakes and rivers for one last session before the season ends. 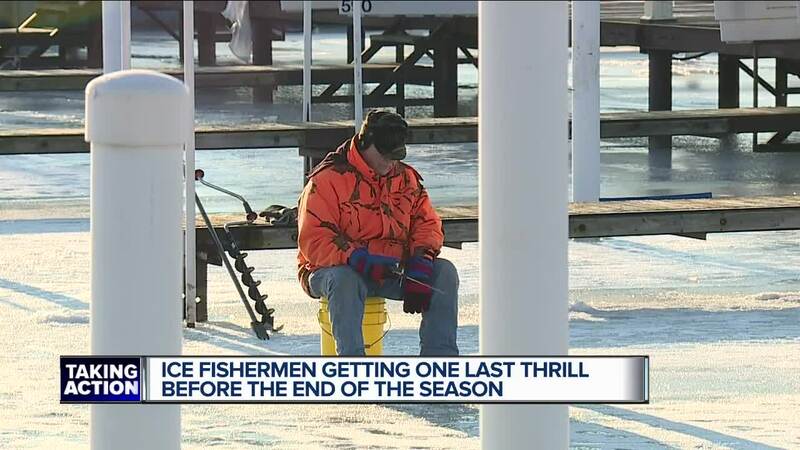 ST. CLAIR SHORES, Mich. (WXYZ) — We’ve turned the page on winter, but some crazed ice fishermen are trying to get a last gasp out of local lake ice. in St. Clair Shores we met one woman whose two-year long journey uncovered a scary trend and a culture that some fear is dying. But 50+ years ago he remembers a much longer season on the ice. “As I started hearing that over and over, and different anecdotes of people being able to drive their cars across Lake Erie at one point I thought — there’s something to this,” he says. She’s taken thousands of pictures as part of a series about the great lakes and how fewer and fewer days are covered in ice. Tim’s is Amy’s dad and actually the driving force that got her onto the ice. “I think as a kid you’re wondering what is this person doing at 8 o’clock in the morning in the freezing cold. Why is he interested in this?” she says. She quickly learned he’s not alone. Add in a polar plunge, and countless fishing trips and one string tied this wild, beautiful Michigan ice culture together - a fear that winter is shrinking. Some argue it’s a cycle — others, global warming. Sacka believes the latter of the two, noting this year we saw ice come late, and disappear early. A scary thought for those who’ve grown to love this sport and the magnetism of the ice that makes so many feel like family. So, in just a few days ice and snow protected in the canals will be gone and that means the start of a new fishing season. But for those that remember the old day, well they would have had a couple extra weeks of ice. And that, they say, is the real shame.